Fiber reinforced plastic sheet and panels are made by combining two or more materials (fibers with matrix materials) to give a unique combination of properties such as high strength, fire resistance, and chemical resistance. FRP panel consists of a continuous phase called matrix and a dispersed phase called reinforcement. These sheets and panels are employed in various end-use industries such as construction, transportation, industrial, sports, energy, aerospace, consumer goods, and electrical & electronics. Automotive manufacturers and OEMs are seeking innovative materials to reduce vehicle weight, and achieve fuel efficiency and carbon emission targets due to the implementation of stringent environmental norms and government regulations. Composites offer several structural and weight advantages over traditional steel and injection molded automotive parts. These are used as raw materials to manufacture various structural, interior, exterior, and other automobile components. Composites offer high stiffness, tensile strength, temperature tolerance, low weight, and thermal expansion. Therefore, they are preferred in the manufacture of automobiles. Polymer reinforced composites offer excellent crash performance than traditional steel. The latter typically absorbs just 35J/kg of energy, while thermoset composites absorb nearly twice of this. Thermoplastic composites absorb five times to six times more energy than steel. Therefore, composites in vehicles offer better safety along with weight reduction. Stringent government regulations for fuel efficiency and safety are driving the demand for lightweight vehicles. This, in turn, is propelling the FRP sheets & panels market. Demand for electric vehicles is rising in the automobiles industry. This is anticipated to boost the demand for composite materials, thereby augmenting the demand for fiber reinforced composites in the automotive industry. FRP sheets and panels are extensively used in applications such as roofing, interior wall panels, and exterior façade in the building & construction industry. The global construction industry is expanding at a significant pace. According to Oxford Economics, a leader in global forecasting and quantitative analysis, the construction industry is estimated to expand at an average annual growth rate of 3.9% p.a. till 2030. This steady growth is projected to stimulate the demand for wall panels and roofing solutions, thereby driving the demand for FRP sheets and panels in the next few years. FRP panels possess properties such as high strength, stiffness, environmental resistance, and lightness of weight. However, availability of substitutes such as engineered plastics, TPOs, TPUs, aluminum, and other metal alloys is estimated to hamper the market. This is primarily due to the complex manufacturing process and high cycle time required to manufacture fiber reinforced sheets and panels. Key players profiled in the FRP sheets & panels market include Stabilit Servicios S.A. De C.V., Crane Co., US Liner Company, Enduro Composites Inc., Brianza Plastica S.p.A., Optiplan GmbH, Polser Fiberglass Reinforced Plastics Inc., and Panolam Industries International, Inc. Collaborations, mergers and acquisitions (M&A), geographical expansion, and development of new products are strategies implemented by major players. In October 2018, Verzatec Group, the parent company of Stabilit Servicios S.A. De C.V., acquired Koscon Industrial SA. The acquisition led to expansion of the former’s portfolio of FRP panels and plastic laminates. Demand for FRP sheets and panels has increased significantly in the manufacture of aircraft. FRP sheets and panels can also provide higher flexibility, as these materials can be tailored to meet design requirements. They also offer significant weight advantages. Composite materials used in aircraft are generally reinforced fibers or filaments embedded in a resin matrix. Composites are employed as raw materials in the manufacture of various parts of an aircraft such as radomes, rudders, cabin and cargo hold furnishings, fin leading edges and tips, ailerons, nacelles, and wing/fuselage (forward and rear). In terms of value, the aerospace segment accounted for significant share of the global FRP sheets & panels market in 2017, due to the superior weight-to-strength ratio offered by FRP sheets and panels. In terms of volume, Asia Pacific and North America are the leading regions of the global FRP sheets & panels market. In terms of value, the market in Asia Pacific is projected to expand at a substantial pace during the forecast period, followed by that in Latin America and Middle East & Africa. The market in Latin America is estimated to expand considerably during the forecast period, owing to the rise in the industrialization and increase in demand for these sheets and panels in building and construction applications in the region. The market in India, ASEAN, Japan, and China is anticipated to expand at a significant pace in the next few years, due to the increase in demand for FRP sheets and panels in various applications such as building & construction, transportation, electronics and electrical, and consumer products. This report analyzes and forecasts the FRP sheets & panels market at the global and regional levels. The market has been forecast based on volume (kilo tons) and value (US$ Mn) from 2018 to 2026. The study includes drivers and restraints of the global market. It also covers the expected impact of these drivers and restraints on the demand for FRP sheets and panels during the forecast period. The report also highlights opportunities in the FRP sheets & panels market at the global level. The report comprises detailed value chain analysis, which provides a comprehensive view of the global FRP sheets & panels market. Porter’s Five Forces model has also been included to help understand the competitive landscape of the market. 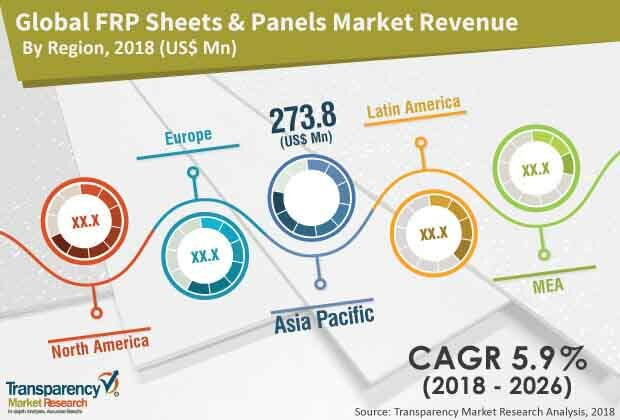 The study encompasses market attractiveness analysis, wherein various applications of FRP sheets and panels have been benchmarked based on their market size, growth rate, and general attractiveness. The study provides a decisive view of the global FRP sheets & panels market by segmenting it in terms of application. The segment has been analyzed based on the present and future trends. Regional segmentation includes the current and projected demand for FRP sheets and panels in North America, Europe, Asia Pacific, Latin America, and Middle East & Africa. The report also covers the demand for FRP sheets and panels in individual application segments across all regions. Key players operating in the FRP sheets & panels market are Stabilit Servicios S.A. De C.V., Crane Co., US Liner Company, Enduro Composites Inc., Brianza Plastica S.p.A., Optiplan GmbH, Polser Fiberglass Reinforced Plastics Inc., and Panolam Industries International, Inc. Among these, Stabilit Servicios S.A. De C.V., Crane Co., and Panolam Industries International, Inc. have been profiled in terms of attributes such as company overview, financial overview, business strategies, and recent developments. The report provides the market size (in terms of value and volume) of the FRP sheets & panels market for the base year 2017 and the forecast between 2018 and 2026. Market numbers have been estimated based on application of FRP sheets and panels. Market size and forecast for each application segment have been provided for the global and regional markets. In order to compile the research report, in-depth interviews and discussions were conducted with several key market participants and opinion leaders. Primary research represents a bulk of research efforts, supplemented by extensive secondary research. Annual reports, press releases, and relevant documents of key players operating in various application areas have been reviewed for competition analysis and market understanding. Secondary research also includes recent trends, technical writing, Internet sources, and statistical data from government websites, trade associations, and agencies. This has proved to be the most reliable, effective, and successful approach for obtaining precise market data, capturing market participants’ insights, and recognizing business opportunities.